1. Gerber Graduates- I was sent some tri-suction bowls and spoons from Gerber Graduates by Nuk. I have a strange obsession with baby spoons and think that these are too cute! We are just starting solids a bit and these will be perfect for feeding Adalyn. They have a soft silicone tip to be gentle on teeth and gums. The bowls will be great for when she feeds herself so that the bowl does not fall (or get thrown) off her high chair. These products are affordable and have good reviews. 2. 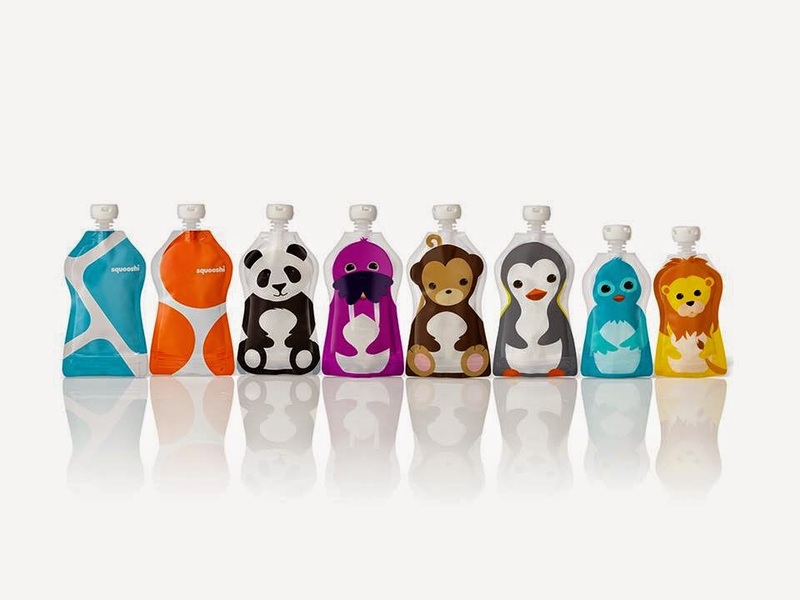 Squooshi Food Pouches- From almost all moms, I hear that food pouches are awesome for feeding babies and toddlers. They can feed themselves, there is less mess and they are easy to take on the go. As I stated, I plan on making most of Adalyn's food and these pouches will come in handy in feeding Adalyn. I love the fun animal patterns. These are BPA free as well and are reusable. This way, I can control the ingredients that go into her food and skip salt and sugar. Fill them with applesauce, smoothies, fruit, grain and veggie purees, homemade baby food, yogurts, oatmeal – anything of a squishy consistency. Worried about cleaning them, don't! Just pop them in the top rack of your dishwasher or wash them by hand with warm soapy water. 3. Baby's Journey BabySitter- This product from Baby's Journey called the BabySitter is going to come in handy on the go. It is a portable pad that straps to a chair to make any chair into a high chair. We will use it at other people's houses and at restaurants. I think that it is a great idea because it does not take up a bunch of room like a highchair would. It can be used for ages 6 months to 2 years old. It is available at Target.com for $29.99. The giveaway will be for one Baby's Journey BabySitter to one reader! The Always Ready Changing Station looks pretty awesome!M changing table area is always so scattered, this would be a great way to keep me organized! The Magic Play tray would be ideal when traveling. I'm also liking this babysitter for eating out. We have an 8 months old grandson that lives with us right now, and some of these products would be really handy. I also like the gate for the doorway--much easier than the one I had when my children were young. I like the easy reach folding tub, myself! Looks comfortable and saves space. I really like the SaniLite™ UV Hand Held Sanitizer. I like the Easy Reach Folding tub. Thanks for the chance. I like the SaniLite UV Hand Held Sanitizer, it seems really handy!